Mumbai Indians who were still hoping for a play off spot were in a state of "DO or DIE" as they were playing the top ranked Kolkata team. The match was not to be missed. It was action packed and one of those that went down to the wire. Knights bowlers proved their captains decision of opting to bowl first a wise one! They did well to contain the opening pair of Parthiv Patel and in form opener Lendl Simmons. Shaking Al Hasan, returning to the team picked up two wickets inside the first seven overs itself to give his side an upper hand in the game. along with him Morne Morkel, the South African speedster who was also coming back into the side picked up the crucial wicket of Simmons while Shakib got Patel and Ambati Rayudu. 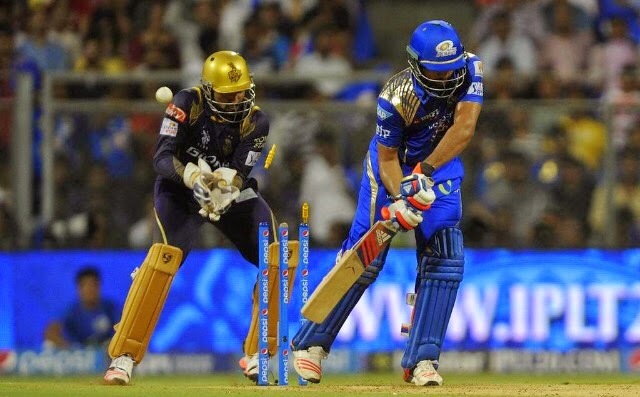 After the opening loss, skipper Rohit Sharma and Kieron Pollard started reconstructing the innings for Mumbai.They put on 32 together before the West Indian mystery spinner Sunil Narine got the former out with a ripper. But the loss never troubled these two! The young and talented all rounder Hardik Pandya and Pollard stitched on an unbeaten 92 run partnership that took their team to a defendable target. On any day, Pollard would have been the aggressor in this partnership. But not there! Surprisingly Pandya was the wrecker-in-chief! He smashed the ball to every nook and corner of the Wankhede stadium bringing up his maiden half century. He made 61 off just 31 balls to take Mumbai to 171/4 after 20 overs. In a chase of 172, KKR started off well with the experienced duo of Skipper Gambhir and Uthappa taking on. They put up 45 in a space of just 5.3 overs. But the turbanator, Harbhajan Singh removed the latter on 25 in the sixth over to give his side a breakthrough! The next ball, Manish Pandey was run out for one! Later,Jagdeesha Suchith the young left armed got the dangerous Fautam Gambhir out on 38 to put KKR in a spot of bother. Yusuf Pathan and Shakib threatened to take it away from MI, but just then Vinay Kumar got the Bangladeshi out on 23. Andre Russell and Suryakumar Yadav were then sent back cheaply buy Malinga and Mcleanaghan respectively to virtually dash KKR out of the game. Pathan continued his onslaught but later got upt to Pollard on his first ball of the penultimate over! Pollard was defending 12 runs in the last over! Piyush Chawla failed to hit anything on the day scoring 1 off 7 balls. Pollard and Pandya won it for Mumbai. 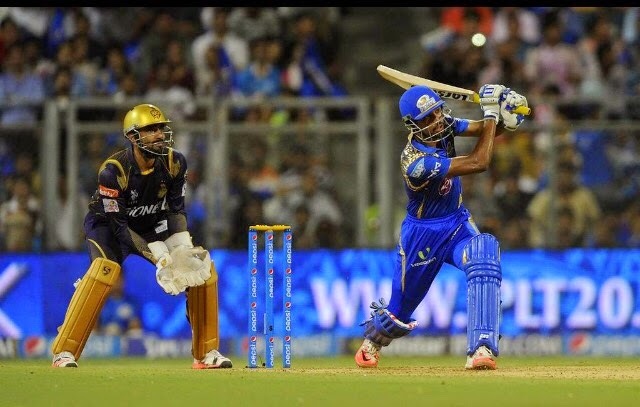 Man of the Match: Pandya was declared the player of the match for his blistering knock.